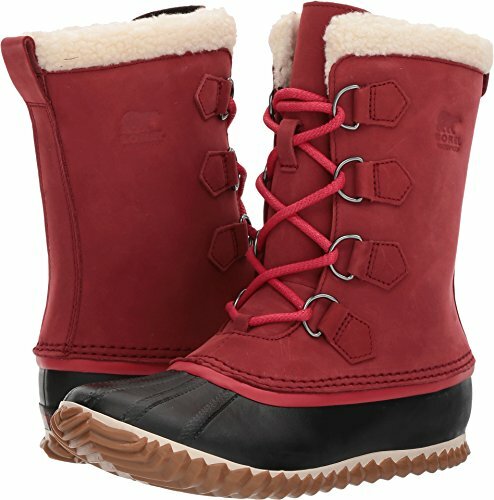 Roam the winter scene in total style and complete comfort when you wear the SOREL® Caribou™ Slim winter boot! Waterproof nubuck leather upper. Faux-fur snow cuff for added warmth. Seam-sealed waterproof construction keeps out the wet elements for a drier, more comfortable foot environment. 100g synthetic insulation for added warmth and protection from the cold. Soft microfleece lining. Cushioned textile footbed for added underfoot comfort. Handcrafted, waterproof, vulcanized rubber shell. Durable rubber outsole with a herringbone pattern for excellent traction and grip on snowy terrain. Imported. Measurements: Weight: 1 lb 2 oz Shaft: 9 in Product measurements were taken using size 8.5, width B - Medium. Please note that measurements may vary by size. Weight of footwear is based on a single item, not a pair. Roam the winter scene in total style and complete comfort when you wear the SOREL® Caribou™ Slim winter boot! Faux-fur snow cuff for added warmth.